and he continues to challenge and improve the ways individuals and institutions view sexual assault. 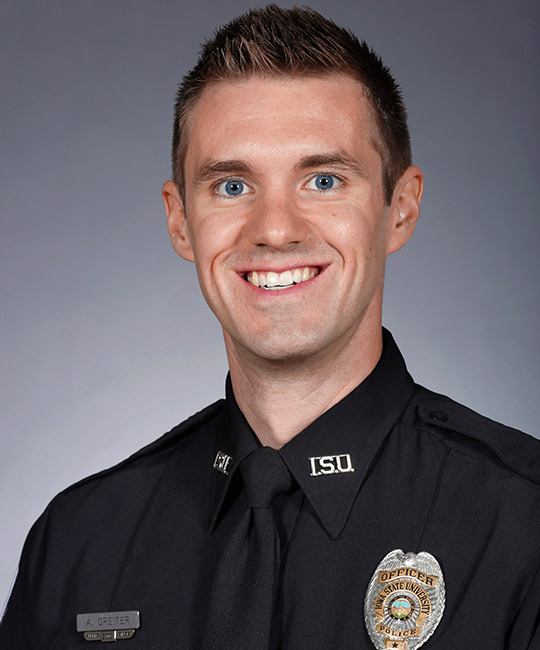 Anthony Greiter is a 10-year veteran of the Iowa State University (ISU) Police Department. He began his career in 2006 as a police dispatcher. In that role, he was a primary point of contact for the Story County Sexual Assault Response Team (SART). He remains a valuable member of the Story County SART, serving both as a first responder and Community Outreach Specialist, a position he has held since 2013. When he was hired as a police officer in 2009, Officer Greiter immediately identified a passion for two areas: sexual assault response and educating the community through outreach. Combining his two passions, he provides training for other professionals, and he has educated more than 35,000 community members on the topics of sexual assault, bystander intervention, and best practices for sexual assault response. Officer Greiter is a frequently-requested speaker by ISU faculty and students alike, and he continues to challenge and improve the ways individuals and institutions view sexual assault. Officer Greiter also uses his expertise in social media to engage with the public regarding these important topics. Because of his ability to blend of humor, information, and community input, ISU PD has consistently been recognized by the International Association of Chiefs of Police (IACP) Center for Social Media, as being among the Top Five Campus Law Enforcement Agencies on Facebook and Twitter. In April 2017, he dyed his hear teal (while in uniform) to help bring awareness to the issue of sexual assault on Start by Believing Day. Clearly, Officer Greiter has a true passion for this work, and his everyday actions powerfully demonstrate this commitment to being a Champion of Change in his community.